Kryptonian Warrior: Tron Legacy's Garrett Hedlund Offered Role Of Kaneda In Akira Movie? 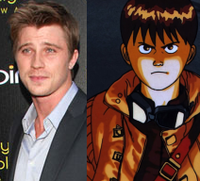 Tron Legacy's Garrett Hedlund Offered Role Of Kaneda In Akira Movie? It would seem that now that the live-action Akira movie is back on track a few bits of news have been leaking about who will star in what could potentially be an amazing, or amazingly bad, remake of the classic 1988 Anime movie. Garrett Hedlund of Tron Legacy has officially been offered the lead role of Kaneda but as of this moment he hasn't yet accepted the part. I think that's a pretty cool bit of casting, if he accepts, and I can't think of many American actors who would be the right age or look to pull of the highly Americanised version. The other news is that the studio also want Gary Oldman, Helena Bonham Carter and Keira Knightly in as yet unknown roles. Looking forward to this, no matter how many people I know are definitely not!